Maybe it's being a mom, but never in my life have I experience mind clutter like I do now. Keeping track of the schedules for the five people who live under my roof takes up more brain space than I seem to possess. Anyone else know what how this feels? You know, when you have to schedule out your week completely so that you have time to take a shower... yeah... no? 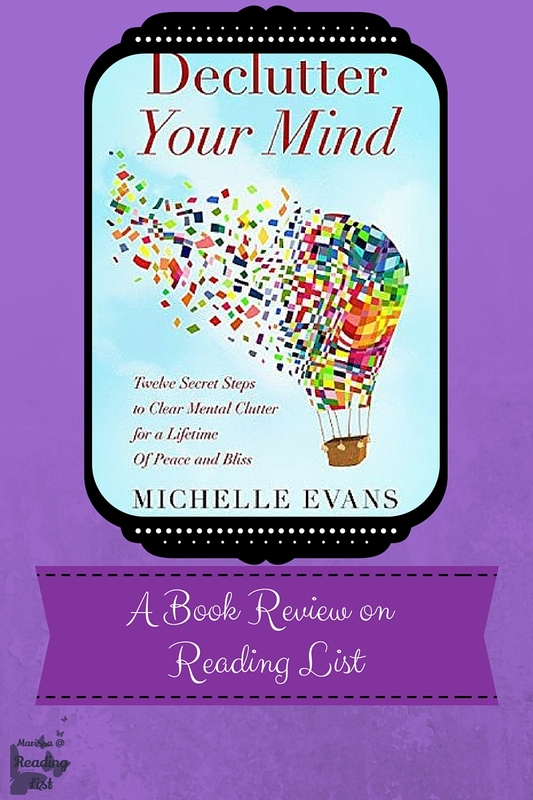 For this reason alone, I was willing to give Michelle Evans' Declutter Your Mind a shot. I mean any tips on how to keep my mind clear of extra clutter seems like an important ability for any mom in today's world. Michelle Evans has put together 12 little baby steps that will help you declutter your mind which can result in more joy and calm in your everyday life. She walks you through clearing your mind by avoiding stores, that being selfish in having a clear mind will help others around you, and how to do less and achieve more in the process. Evans shares the 12 steps, in 3 categories, that she has implemented in her own life to help rid herself of the mental clutter that can rob us from calm and joy in this busy world. This is a quick read that allows the reader to see just how Evans has decluttered her mind and allows the reader to try out any of the steps that might benefit them. The focus on the mind, and not your eating habits or whatever, was nice to see in a book like this. We all know that food and exercise have an impact on our minds, but hardly anyone talks about the smaller steps that we can take in order to clear out the mind while we work on the eating and physical habits. I really appreciated Evan's breakdown of FoMo. The Fear of Missing Out seems to be a real thing these days - and I would agree with her, that it stems from the use of social media. We want to be part of everything and then stress out over everything, and the cycle results in a crazy mind. So her step on FoMo was fun. It was also interesting that she points out that there are times we need to stop over thinking and just do. In fact, she says there are times when we should probably just not think period. 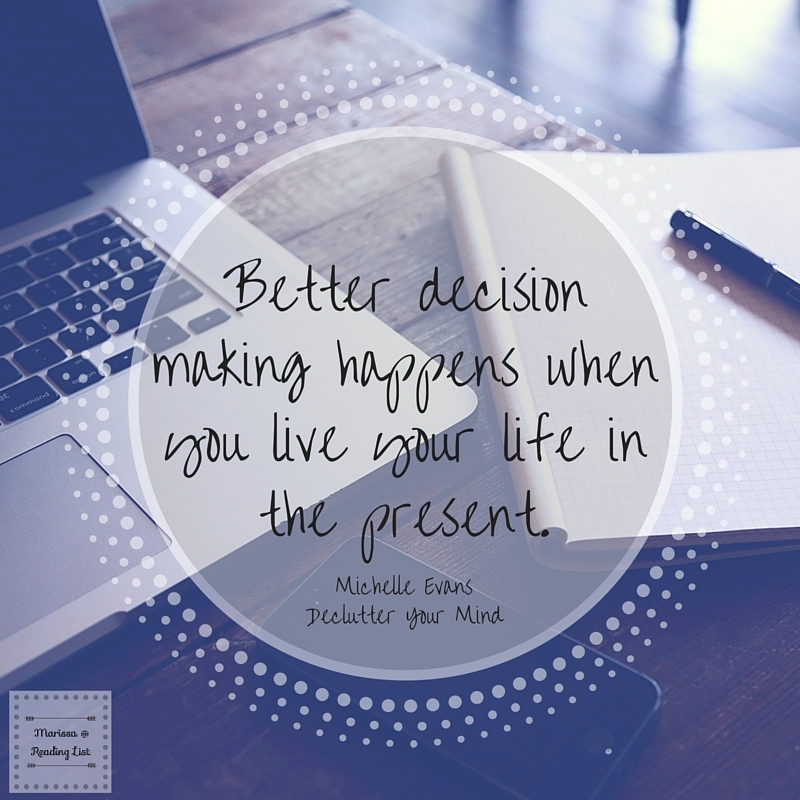 Make a decision and then act on it, follow through without analyzing it forever. And that is probably really good advice for some things. The more I read, the less I felt like I really understood about the mental clutter Evans was talking about. I am an organized person, and I am starting to realize that organization includes my mind. Plus some of her steps worked for her, but would not help others at all. She suggests waking up earlier to get more accomplished before leaving for work... this isn't very helpful if you are a stay-at-home kind of person who already wakes up before most. Another odd point she made was near the end about aromatherapy, which I am not against, but her breakdown on picking a new scent and then going through painstaking steps to make sure you don't experience the scent until the moment you are ready to relax is a little much. No offense because I do know that multi-tasking is not something that everyone should be doing all of the time. But I have always felt better when I multitask, and I do not see it as an evil option in accomplishing more quickly... that is just me. I am only going to give this book three hearts. While it is well organized and clearly gives steps to practically declutter the mind, I am not sure I am the ideal reader for it. For some people I could see this book being extremely helpful, I am just not one of those people. Adults who have an office job are probably the ideal audience here. Those who are feeling the pressures of a 9-5 and balancing a home life on top of it could benefit from more of the steps in this handbook. If you are the kind of person that is always curious how other people stay organized and calm day in and day out, you might be interested in hearing Evan's story, which is what this is. Has our society resulted in too much clutter in our minds? Do we, as a society, have a fear of missing out when we see what others are doing in the midst of our dailies? How do we as individuals take control over our minds in order to be happy, feel joy, and stay calm in a world that moves a million miles a minute? Do you feel like your mind is cluttered? Do you suffer from FoMo? How do you stay calm while the world whizzes by?